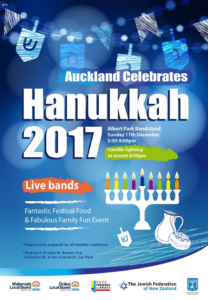 The word Hanukkah (or Chanukah, or other spellings) means “rededication” and commemorates the Jews’ struggle for religious freedom from the Greek-Syrians more than 2,000 years ago (c160BC). The festival lasts eight days and remembers the rededication of the Temple in Jerusalem (on the Temple Mount), where the miracle was that one day’s worth of oil lasted for eight – the time needed to prepare a fresh supply of oil. 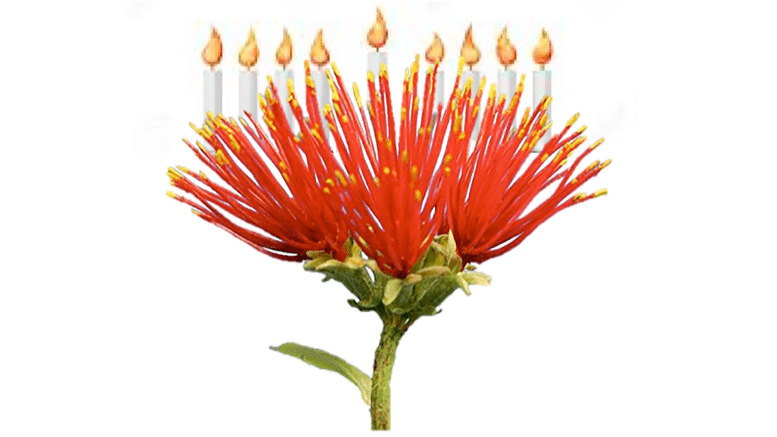 In the great tradition of most Jewish holidays (‘they tried to kill us; we survived; let’s eat’), the food is important: because the miracle was about oil, oily foods are part of Hannukah. 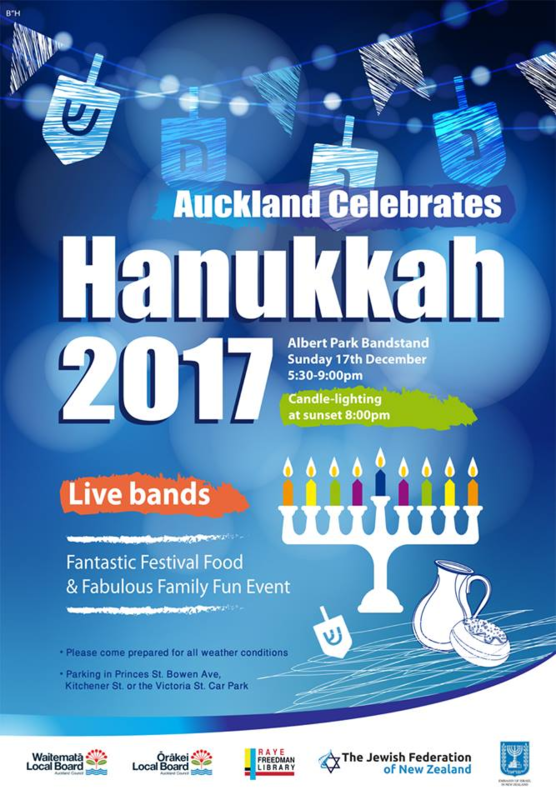 Traditional food for Hanukkah is donuts (“sufganiyot” in Hebrew) and potato pancakes (“levivot” in Hebrew; “latkas” in Yiddish). In New Zealand, Fish and Chips would be most appropriate also. 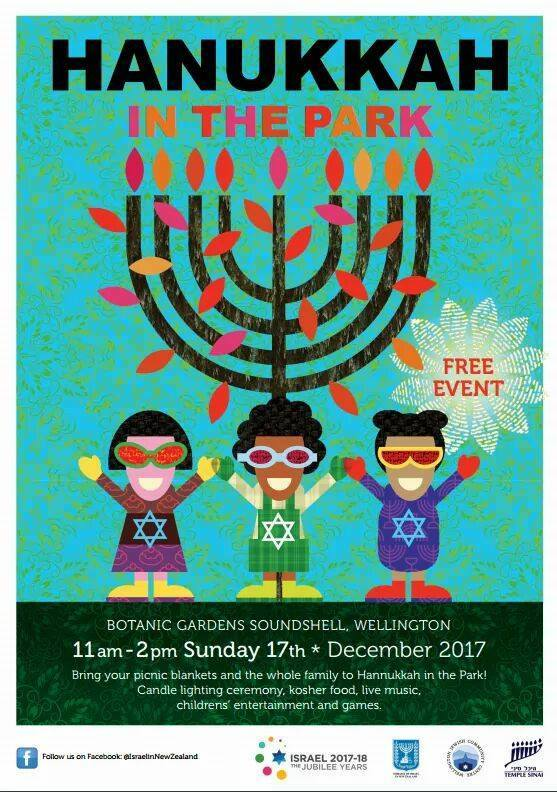 There are public events in New Zealand to celebrate Hanukkah in 2017. 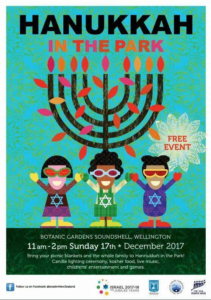 On the first night of Hanukkah, a large chanukiah was lit in front of the beehive; Christchurch had an event on December 14th, in Hagley Park; and there will be events in Wellington at the Botanic Gardens Soundshell at 11:00am, and in Auckland at Albert Park from 5:30pm.